I was out taking a morning walk, and was busy racking my brain as to where to go for fish in the evening. I wanted to make it to Turner Hall in time to catch all of Local Coverage, and it seemed my options were to drive somewhere really early, find a place along the Green Line on my way downtown, or grab fish at Turner. But just then, a sign from God appeared. 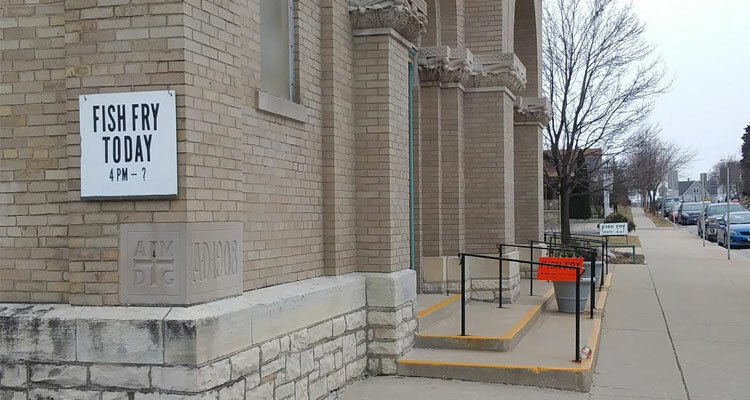 Similar to Saul, who saw a flash of light on the road to Damascus and became Paul, I saw three fish fry signs at St. Augustine of Hippo Parish on Howell Avenue (2530 S. Howell Ave., 414-744-0808) and knew I must heed the call. Fish frys are held at the church once a month from October through April, usually on the third Friday of the month. They are available for dine in or carry-out from 4 to 7 p.m., and carry-out is also available for lunch, from noon to 1 p.m. The fish options are breaded cod ($10 four piece/ $6 two piece [or maybe $8, according to the internet]/ $2 extra piece) and baked cod ($10 two piece/ $6 one piece/ $4 extra piece). Breaded shrimp is also available. All dinners include either french fries, oven roasted potatoes, or a homemade potato pancake, as well as a hot vegetable, homemade coleslaw, rye bread, a dessert, and coffee and milk. Extra coleslaw can be purchased in eight ounce containers for $1, and extra potato pancakes are 50 cents. Kids meals are available, but sadly, they consist of macaroni and cheese, not fish. Beer, soda, and bottled water are also available for purchase. The smell of fried fish began to fill the snow-dusted air as I got about a half block away from the church amid my evening return. It reminded me of a moment from the first time I was there, in October of 2016, when I got a carry-out fish fry. On that occasion I circled around the parish grounds for almost five minutes with the holy smell of fried fish emanating from somewhere that I couldn’t pinpoint. It had been hell, but I eventually found salvation. I wasn’t a lost soul this time, and I knew the fish fry was in the church basement, and that the entrance was on Homer Street. I went in with a purpose. I walked straight ahead to where two people were taking fish orders at a desk. They told me there wasn’t any baked fish left (It wasn’t even 5 p.m.! ), but that really didn’t concern me, as I was getting the breaded fish. I gave them a dollar coupon I had printed off at home, and I requested the large breaded fish fry. They marked a small sheet and gave it to me, and pointed me into the basement hall. The large room was filled with tables, many of which were occupied by diners. There was a table to order carry-out, a counter to pick up carry-out, a large dessert table, and a spot to purchase beverages. To the immediate left was the serving line, where two ladies stood behind a heated food service cart. I gave them my sheet and told them I wanted the potato pancake for my side. In no time I had found a spot to sit, and shortly thereafter someone came around and filled my coffee cup. Although I was supposed to get four pieces of fish, I was given five, perhaps because they weren’t uniform in size. The fish had an unmistakably homemade nature to it. The texture of the breading was rather soft, in an inviting way, and its taste had a superb harmony of sweet and salty to it. Underneath, the fish was of a fine quality. The tartar went together almost perfectly with the fish. I don’t remember the fish and tartar combination being this good a few years ago, but I’m a believer now. The potato pancake was relatively thick, with a soft inside. It was browned on the outside, but wasn’t very crisp. From what I could tell, a good amount of flour was used to make it. It was rather mild in flavor, but in a wholesome, appetizing way. The beans seemed like filler, and I much rather would have received a second pancake instead. The coleslaw was cut into extremely small pieces, and had a distinct, stronger flavor. Overall, it was pretty good, and it made sense they were selling it in bulk containers on the side. There was quality store-bought dark rye bread on the table. I had seen there was soda and bottled water for sale, but somehow I had missed that there was also beer. I guess I just thought maybe it wouldn’t be being sold in a church basement. Towards the end of my meal I did a double take when I thought I saw a guy drinking one. Yep, it was a Spotted Cow. And then I did a triple take, because I noticed the guy had a clerical collar. It turned out it was the pastor, who was greeting and giving well wishes to people. I then looked at the beverage stand. It clearly said beer was for sale, and I could see a few on display. I didn’t end up getting one, but I had been given a dessert coupon, so I walked over to the dessert table and picked out a slice of pistachio cake. After the last bit of coffee and the cake, I was on my way. I was in and out of the church in under a half an hour, and got home with plenty of time to spare before heading downtown. 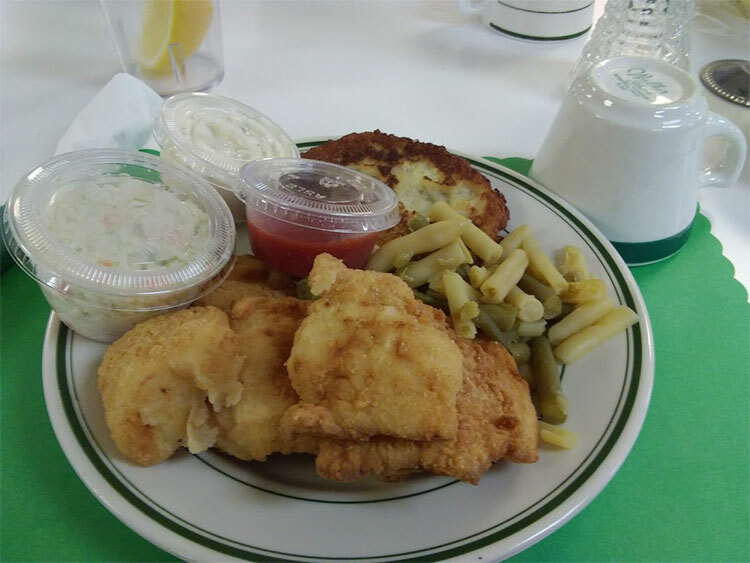 Despite the unavailability of Old Fashioneds and clam chowder, and even though I was a little hungry when I left, I thoroughly enjoyed the fish fry at St. Augustine of Hippo. The fish and tartar combo was first-rate, and the pancake and coleslaw didn’t disappoint. The meal was inexpensive, and for another $3.50 I could have gotten another piece of fish, an eight ounce container of coleslaw, and another potato pancake. And there was just something about eating a fish fry in a church basement. It lacked the affectations that so many restaurants have, and there was a communal nature to the experience. They are doing the Lord’s work in that basement. Go get yourself saved.